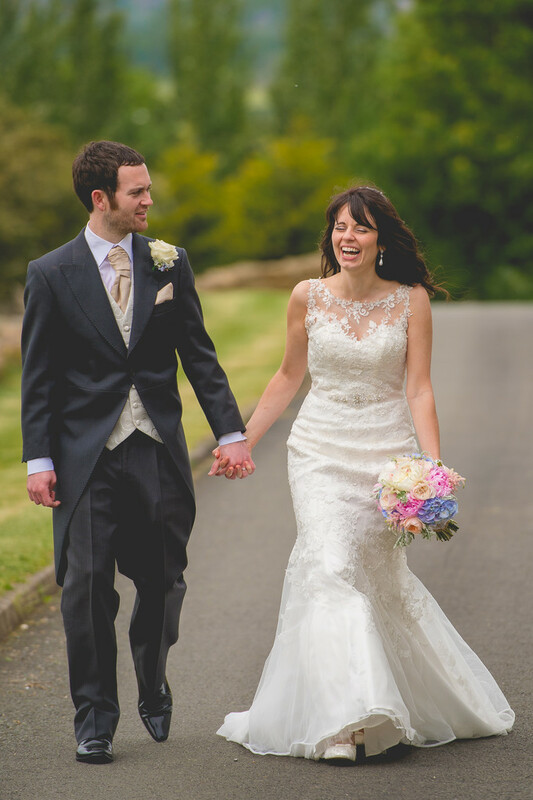 Cathy and Andy got married at Deer Park Hall in Worcestershire, a wonderful wedding venue set on the border between Worcestershire and Gloucestershire. The venue has a huge lawn as well as a beautifully kept garden, but one of the golden spots for wedding photos is a private drive down the side of the venue. Cathy and Andy were walking up the drive towards Lambs Leap Lawn, where I was taking photos at the time. I turned to photograph the bride and groom making their way towards me, when Cathy burst out laughing. I have no idea what was said, but given the look on Andy's face, Cathy found it an awful lot funnier than he did! At the top of the drive is a series of lavender bushes, now fully grown but these plants were small when these photos were taken. When the bride and groom had reached the top of the drive, I asked them to stop quickly in order that I could take the photo you see above. I knelt down in order that I could frame the couple with the juvenile lavender plant at the bottom of the frame. The light was perfect for Cathy and Andy's wedding day, with the summer sun beautifully diffused by a thin layer of cloud which you can see at the top of the image.